Chrysoprase and Sterling Silver Pendants. Wholesale. Buy Australian Gemstone Jewellery Directly from Supplier. 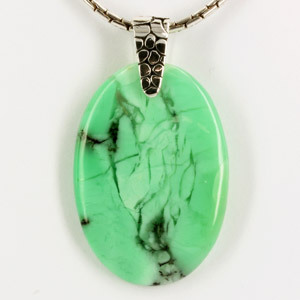 Chrysoprase is a green variety of chalcedony and can be various shades of green, sometimes containing beautiful inclusions of dendrites that can make the stone look like an ancient Chinese ink and wash painting. Some of the best chrysoprase occurs in a couple of locations in Australia. One, perhaps the best known, is near Marlborough in Queensland. 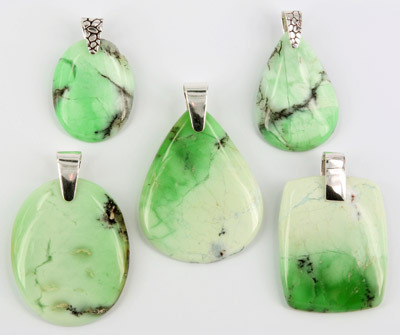 Other locations where high quality chrysoprase is found are in Western Australia. There are also a few other places in the world where chrysoprase occurs. Chalcedony is made up of micro- or cryptocrystalline silicates. This means that it is not made up of a single crystal but of a large number of tiny microcrystals. The most common form of chrysoprase is coloured by nickel mineralisation, but a rare form of chrysoprase is coloured by chromium mineralisation. The chalcedony group of quartzes is large and varied and contains, apart from chrysoprase, such stones as jaspers, agates, etc.